In April 2008, it was announced that The Webb Sisters had been chosen to join Leonard Cohen on his first tour in fifteen years. The world tour started in Fredericton, Canada in May 2008 and concluded at The Colosseum at Caesars Palace in Las Vegas, Nevada in December 2010. 246 shows were played. 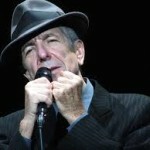 The ‘Leonard Cohen Live in London’ was recorded in July 2008 at London’s O2 Arena and released on March 31, 2009. Charley and Hattie were featured on the DVD on the song “If It Be Your Will”. At one of his concerts, Leonard Cohen explained how this song was written as more of a prayer than a song at the time. It is about a rough time in his life and he is appealing to God to relieve his burden. As well as humbling himself and and basically stating that he is not in control of anything, and God owes him nothing. The song springs from a deep feeling heart which contemplates the unfortunate state of the human condition as being like “all these burning hearts in hell”. It asks God to spill his cool relief over those who are burning up with grief, sorrow, trouble or pain. It seeks for a better form of existence in the presence of God, clothed in “rags of light” when the night of sorrow will be over.